My most frequent request is for more feeding babies posts. The consensus being: carbs, cheese, meat are no problem for their kids, but there is concern over vegetable consumption. I don't really feed babies specifically any more, but we are still not quite all eating the same thing. I am feeding toddlers, which comes with both more options and more negotiating than babies. Another tip I am trying to implement, which I picked up from my sister in law, is to keep snacks after lunch to a minimum. Aren't we more apt to try new things with an appetite? She only offers veggies and hummus between lunch and dinner and I've been trying to do that. If they are not hungry for that, then they can't really be *that* hungry. 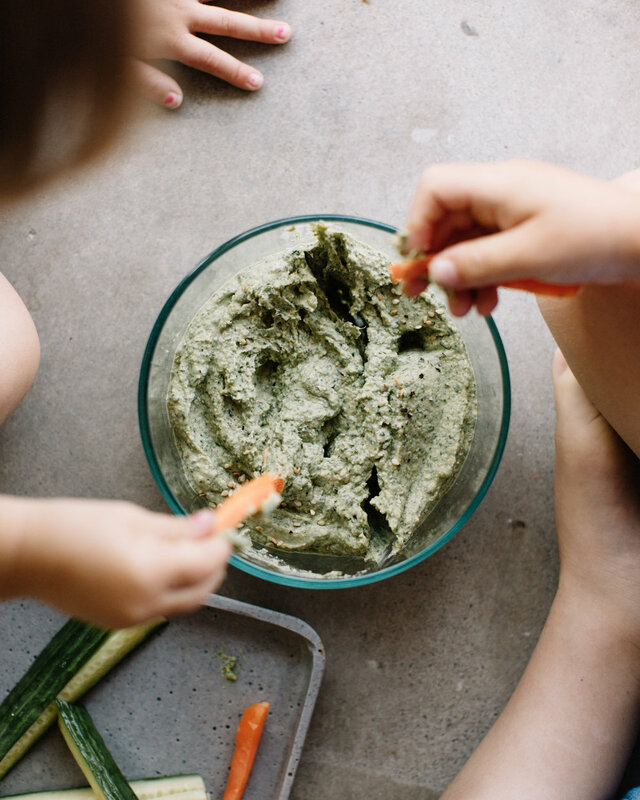 No bars, crackers, string cheese, or whatever your kids' most requested snacks are. When I keep throwing snacks at them in that 4-6 window when they're asking for food and I'm trying to hustle back from an afternoon activity and get dinner together, they eat about one bite of dinner because they are not really hungry. They don't want to try new things or even sit at the table. The goal is to have them come to the dinner table hungry if you want them to eat what you're eating. Do you have any other good tips? Some of these "recipes" seem silly to write down, but I understand that some of us, especially with tasks outside of our wheelhouse, like to just be told what to do. Below are a couple things that my kids are into lately, and sides we adults enjoy eating too. 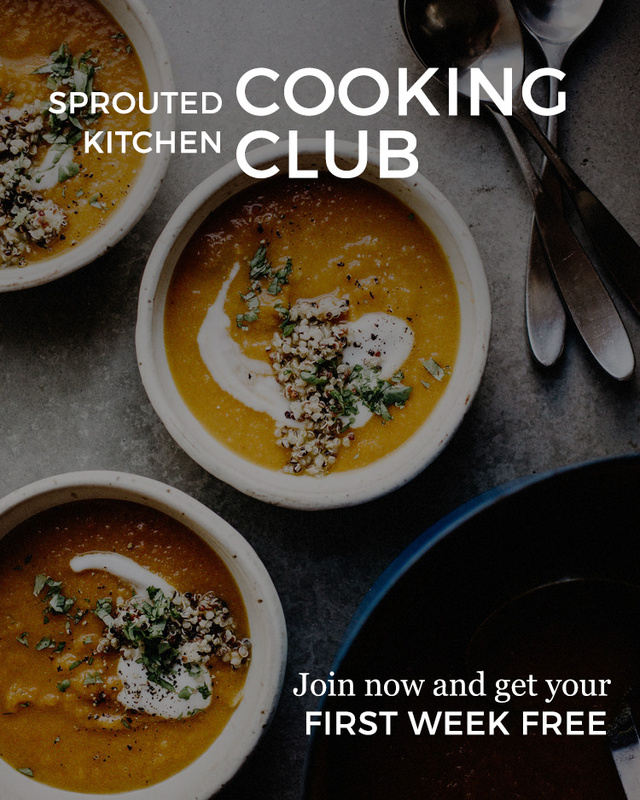 Roasted cauliflower with tahini sauce? Yes please. Forever. Cut and prep this in advance so it's ready in the fridge when wee ones start asking you for food. The hummus will keep about 5 days before the color begins to brown. When you see how silly easy it is to make hummus at home, you can use it as a base for all sort of vegetable add ins: a cooked beet, jalapeno cilantro, roasted red pepper. I also love the one made with red lentils from Near and Far. Barely wilt the greens, for just a minute, in a tablespoon of water. Set aside to cool. Into a food processor, combine the garlic, tahini, chickpeas, lemon juice, olive oil, salt and pepper and process until smooth. Tip in the wilted greens and blend again until fully incorporated. Taste for salt and pepper. Thin with lemon juice or water as needed. Store in an airtight container in the fridge. Serve with cut vegetables, crackers, or as a sandwich spread. I like the taco seasoning from Trader Joes, it does have some sugar, but doesn't have a bunch of other junk in it. If you are looking to just pull from your own spice cabinet, a mix of cumin and chili powder will be great alternative. Rolling them in cornstarch or arrowroot powder first, helps create a barrier to soak up the potatoes' natural moisture content and ensure a bit more crispiness. 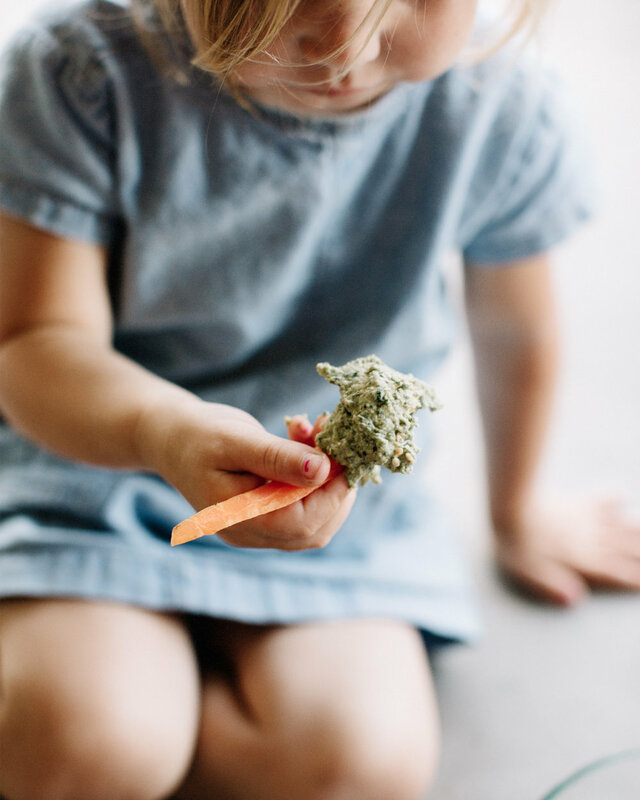 Even a very discerning toddler will not notice, but I am adding this step because I like to eat them this way :) If you have leftovers, they are a perfect addition to a breakfast burrito with some scrambled eggs, greens and shredded white cheddar. A dairy free option for the dip would be to use one large, ripe avocado in place of the yogurt. Cut the sweet potatoes into wedges, no more than 1/2" thick. Toss them in the cornstarch or arrowroot to roughly coat (optional). Drizzle with the oil, toss again. Sprinkle the seasoning, toss again. Spread the potatoes in an even layer , using two pans if necessary to avoid too much overlap. Roast for 25 minutes until tender. 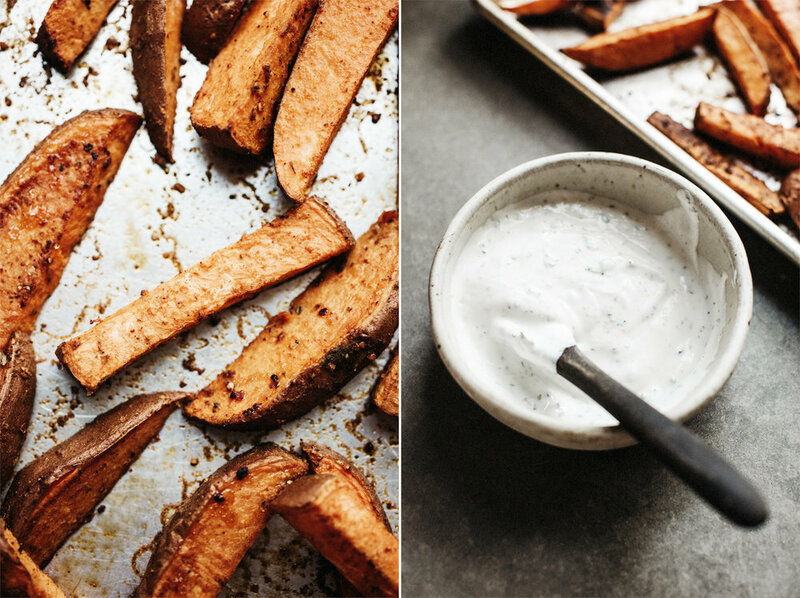 While the potatoes are cooking, mix up your yogurt dip. Stir together the yogurt, garlic, lemon juice, cilantro and a pinch of salt and pepper. The beautiful thing about cauliflower is that is doesn't have much flavor on its own, so it can go any direction. I let my kids sprinkle the seeds on and put this on their plate with a dollop of the tahini sauce or ketchup, when I'm in a pinch. It's also great mixed into some mac n cheese or into cooked brown rice and call it a complete meal. * Mix 1 Tbsp. sesame seeds, 1 Tbsp. poppyseeds, 1 tsp. dried onion flakes, 1 tsp. dried garlic flakes, 1/4 tsp. sea salt and pepper. Preheat the oven to 425'. Break the florets off, away from the core of the cauliflower and cut the core into 1" pieces as well. Toss everything in the oil to coat. Sprinkle on the salt and bagel seasonings and toss again. 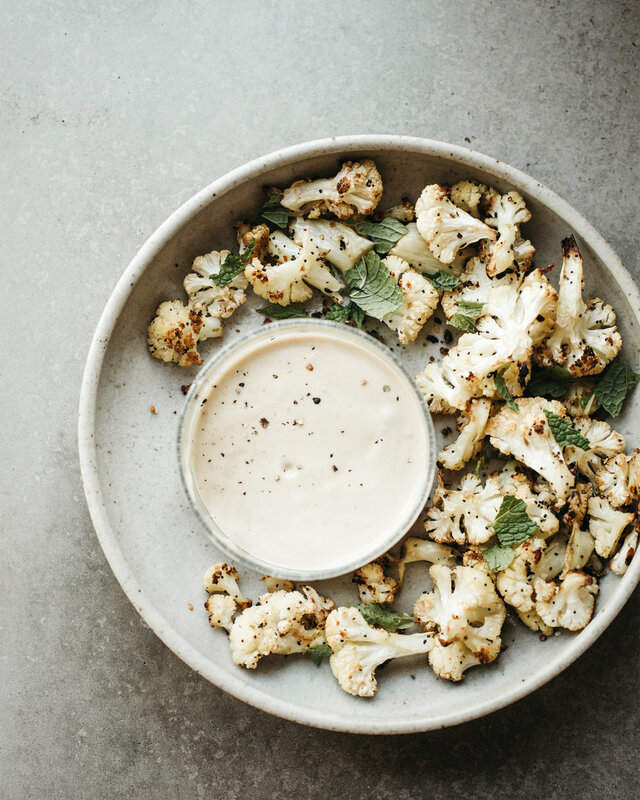 Spread the cauliflower in an even layer and roast on the middle rack for 25-30 minutes, tossing the vegetables halfway through roasting. Remove to cool. While the cauliflower roasts, mix the tahini sauce ingredients. Stir together the tahini, garlic clove, maple, water, lemon juice, cayenne and a pinch of salt and pepper.